Singer Rachel Mayfield sent this picture of the band. 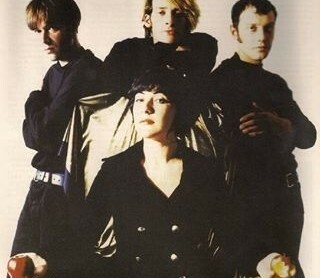 Delicious Monster were a female-fronted Birmingham-based indie/rock band active in the early 1990s. The band released five EPs (‘Dull, Dull, Dull’, ‘Power Missy’, ‘Snuggle’, ‘Ripped’ and ‘Big Love’) and one LP (‘Joie De Vivre’). Members were: Rachel Mayfield (vocals, guitar), Mark Joseph Stokes (guitar), Ian ‘Huck’ Whitney (bass) and Stephen Thorne (drums, piano). 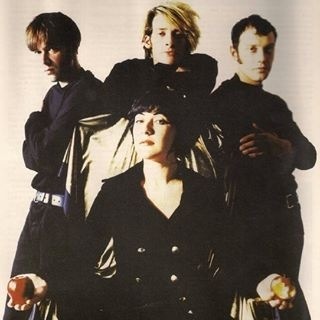 The single ‘Power Missy’ was named as single of the week by both NME and Melody Maker magazines. 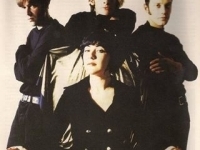 The band were championed by BBC Radio luminaries John Peel and Mark Radcliffe and toured extensively with bands such as Suede, The Boo Radleys (both of whom named Delicious Monster as their favourite up-and-coming band), Belly, Dodgy and The Cranberries. Delicious Monster split in 1995. Rachel Mayfield is now a solo artist. Her last album, ‘Freedom’, was recently voted album of the decade. Both Ian ‘Huck’ Whitney and Stephen Thorne still play in her band. I was a big fan of Delicious Monster around the time they released the singles/Album, and still have all of them on CD. I always wandered what happened to them, as they were one of my favourite bands at that time, and never got the success that they deserved.